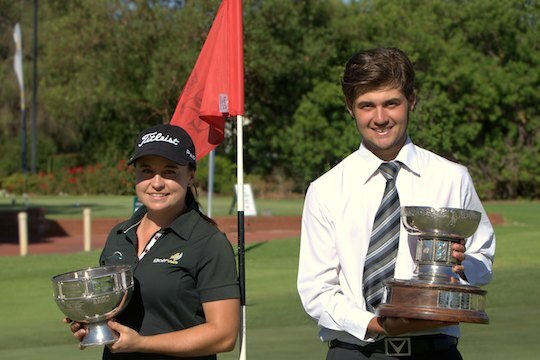 Curtis Luck and Hayley Bettencourt have won the Western Australian Amateur Championships at Royal Perth Golf Club. Luck, who hails from Cottesloe Golf Club, defeated Australian number four Cameron Davis of New South Wales 5&4 to collect his fourth title of the year to add to his NSW Strokeplay title, Victorian Junior Masters title and the WA Amateur Medal that he won last Thursday to become top qualifier for the championship. Luck also finished finalist at the Australian Amateur last month in Adelaide and with Sunday’s win added to his stellar run of results that sees him overtake Ryan Ruffels as the number one ranked Australian male junior. Luck and Davis were all square after 11 holes, but wins on the 12th, 14th, 15th and 16th gave Luck an imposing 4-up lead that he held for the remainder of the match. “Putting was definitely the key to success today,” said Luck following the finals match. With plans to play the US amateur season later in the year, Luck has his sights set on moving from his current ranking of 137 to breaking into the world’s top-50. The win on Sunday moved Luck twelve places and currently has him inside Australia’s top-10 amateur players. “I’m heading to the US for seven weeks to play about five or six events,” said Luck. Luck became a member of Royal Perth late last year with the aim of familiarising himself with the course layout and it has played dividends, breaking Brett Rumford’s and Daniel Nisbet’s course record of 65 with a 63 in Thursday’s final strokeplay round which he credits as his best round to date. In the Women’s championship, Mandurah Country Club’s Bettencourt trailed Mount Lawley’s Hannah Green from the outset, quickly finding herself three back after just four holes. With Green leading by four at the halfway point, Bettencourt eventually took a 1-up lead after 30 holes, which she maintained until the last. “I can’t believe it,” said Bettencourt. Green has now secured three second place finishes this season including a runner-up at the Lake Macquarie Amateur and the Elvie Whitesides in Tasmania, while Bettencourt placed second at the NSW Amateur Strokeplay.